Advancements in technology are stunning when you consider just how far we’ve come over the last 10 years. Home automation has quickly become a top trending advancement and has given a variety of options at our fingertips. New home automation products reduce the consumption of energy in a variety of ways but have largely been unavailable to consumers who have made the jump to solar. The number one reason people make the jump to solar in the Utah market is financial savings, but most people don’t realize that home automation products can save significant money as well. Studies have shown that energy consumption monitoring can reduce your energy use by 5-15 percent just by being aware of what devices are using what energy in your home. Studies have also shown significant savings for smart thermostats: 10-12 percent of heating costs and 15 percent of cooling costs have been documented by switching out an old thermostat to a new automated, smart thermostat. Lighting is also one of Utah homes’ biggest energy users. By automating lights with smart switches and dimmers, you can cut your lighting costs from 20-60 percent. Home automation, especially when paired and connected with an energy production system like solar, can really lower your energy bills and save a ton of money over time, similarly to refinancing a mortgage when rates drop. It’s safe to say that the majority of Utahn’s want to save energy. Some want to save energy for the financial benefits, some to help the environment, and many a combination of both. Either way, we can all agree that waste is a bad thing. Most people desire to be energy efficient as long as they can maintain their standard of living. Home automation allows you this option. Dads across America have historically united in a single cause to turn off all unused lights in the house! Now with home automation, you can set timers and rules, such as: ‘If the basement lights are on for more than 5 minutes after the kids have gone to school, turn them off.’ And boom! No more waste, and no more lectures needed. Definitely a win for tens of thousands of men across America! Start and stop sprinkler zones from your phone. No more running into the basement or garage. Have the garage door on a schedule. Never leave it open all night and risk garage theft again. Set schedules for common things that are left on: lights, appliances, etc. Make any smart light switch or plug motion activated. Locks, plugs, lights, garage, cameras, sprinklers… 1000’s of programming possibilities. And… all connected through your solar energy system! With the only home automation product on the market that connects to your solar and energy monitoring in one app for all your automation, it just makes sense to see if this option might be right for you. If you haven’t made the jump to solar yet, but are considering it, installing a home automation at the same time as installing solar on your roof gives you added savings on cost and with no monthly contracts and fees. 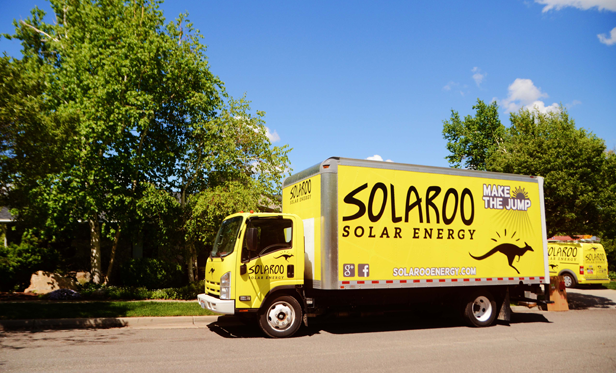 For more information or to request a free evaluation, contact Solaroo Energy.